There is NOTHING like a Serbian wedding, whether we're talking about the exciting SKUP (pre-wedding festivities with food and song and the bartering for the bride's hand! ), or the serenading of the bride by a tambura orchestra before she goes into the church. 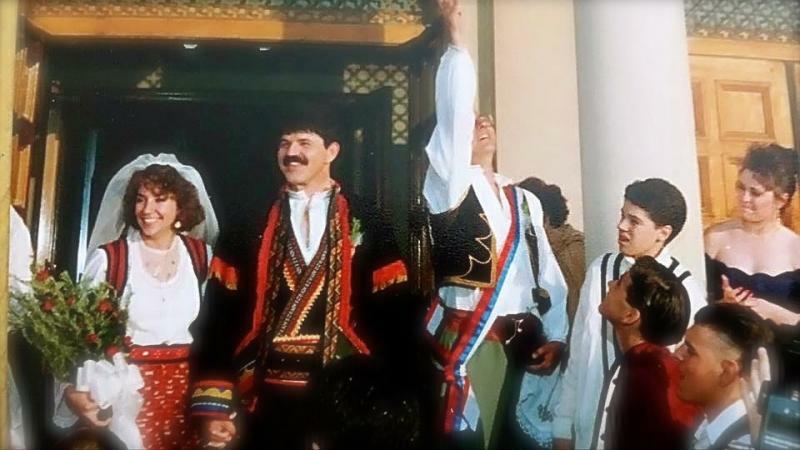 It is the grace and beauty of the Serbian Orthodox wedding ceremony-the solemn Sacrament of Marriage itself, and it's also the heart-thumping kolo dancing outside of the church by the wedding party and well-wishers, while coins are being tossed to promise good luck/financial prosperity. The Bojovich-Stipanovich wedding in St. Stephen's Cathedral in Lackawanna, NY was out of this world! Little ones, Scampering About For the Lucky Coins! What can bring about more smiles than watching our young children scampering to find as many silver pieces as their little fingers can hold, all the while the American and Serbian flags are being waved about so whole-heartedly? Nothing! It's such a beautiful scene! Its a MUST to record with your eyes, ears and heart everything that you're seeing and hearing. That way, you'll always be able to forever cherish and call forth those beautiful memories. Ziveli, Svatovi! SERBIAN WORLD CLASS WEDDING PARTY! This groom, JT, is a Duquesne University Tamburitzans graduate, as is his sister, Jana. But almost ALL of the wedding party had been Shadeland Campers and played their tamburas and danced under the direction of Nikola Jovich from NY, so here, EVERYBODY danced the kolos after church! Check out the flag bearer, Marko Wuslich, in the background. 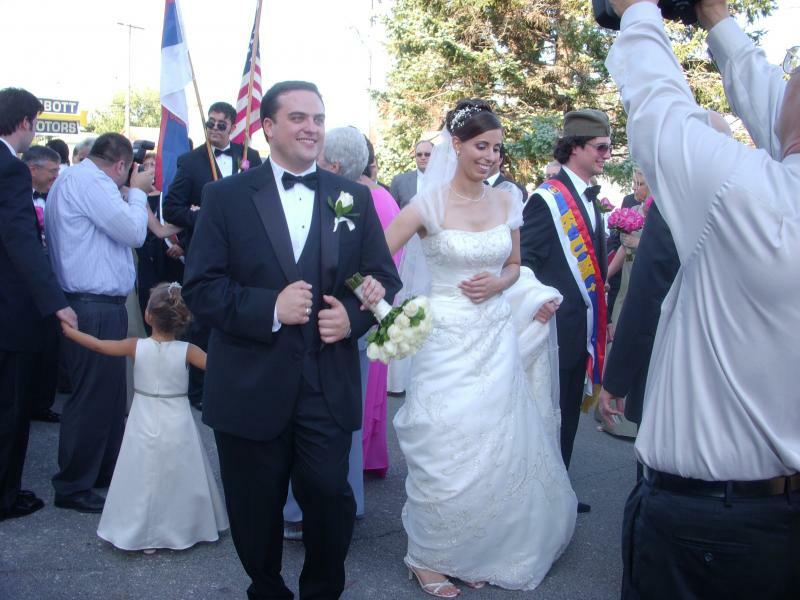 He carried the American and Serbian flags, walking in front of the Bridal Party Limousine, all the way from the bride's home to the church, a Herculean effort that will be talked about for years to come! JT is an international banker, his new wife Aleks is an international lawyer, their Kum, Demetri, is an international Opera singer! The wedding party also featured the bride's brother, Dr. Bronko, who is a Plastic Surgeon, on the international speaking circuit for Harvard University! Others in the wedding party are just as successful in their chosen careers as world-class lawyers and engineers, etc. That this couple chose to highlight their Serbian heritage and culture made EVERYONE in attendance so happy and proud! Ziveli! Long live these newlyweds! JT's brother, Paul (a Ceramics Engineer) was excellent in his role as Dever, bartering long and hard before winning the bride's hand for his brother, as Aleks' brother, Bronko, made sure Paul's offers were worthy of his beautiful, kind and talented sister! Paul's first offer of a Pittsburgh Steeler Terrible Towel coupled with a case of famous Pittsburgh Iron City beer was promptly rejected. A velvet bag full of USA Gold dollars was offered next, but promptly refused as not being 100% gold. A wad of money unrolled and handed over to Dr. Branko at last produced two lovely bridesmaids. But when Paul pulled out an envelope from inside his tuxedo and genuinely looked repentant, saying it was all the Stipanovich Family had left to offer, Bronko rifled through the envelope's money inside, and finally relented, bringing forth the PRIZE to the gasps and delight of the whole neighborhood! The Lira Orchestra broke into "OD-I-se......... for our Aleks and her Mom, Desanka, and EVERYONE was so happy! There is NOTHING like a Serbian wedding. Nothing! 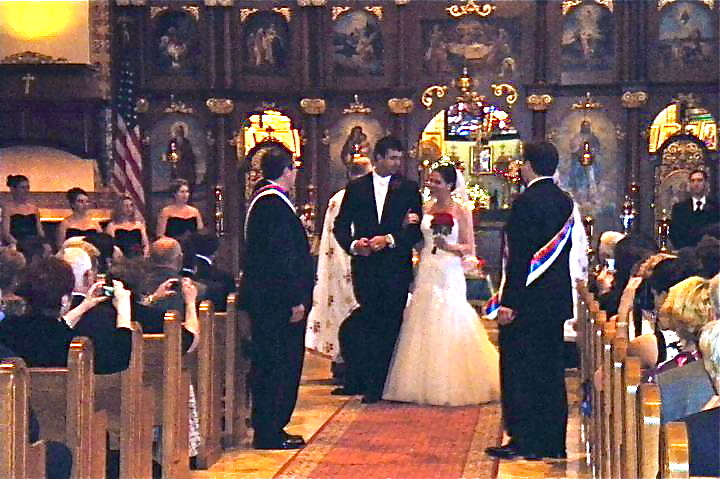 Lackawanna, NY - St. Stephen's Serbian Orthodox Church was the scene of this wedding. Aleks' wedding planner told me the next day at the Country Club brunch that she cried when she heard the Choir sing all of the responses in church, and also the "Oce Nas" and "Mnogaja Ljeta" & "Ziveli" at the start of the reception afterwards. "I'm used to a professional singer here or there, but nothing like that! I couldn't help but have tears of joy in my eyes!" The Choir Loft was full to capacity! It was made up of original Lackawanna Choir members, guests from the St. Nicholas' Choir in Monroeville, and any other singers on the wedding list. It was sooo moving! Officiating at this service were Protopresbyter Rastko Trbuhovich of St. Stephen's of NY, and Protopresbyter Dragoljub Malich of Monroeville. Double joy for all! All the way around! Double? Make that QUADRUPLE! Their wedding favors featured chocolate truffles from BELGRADE, LONDON, BUFFALO (Lackawanna) and PITTSBURGH! Click bottom right of all photos to enlarge! 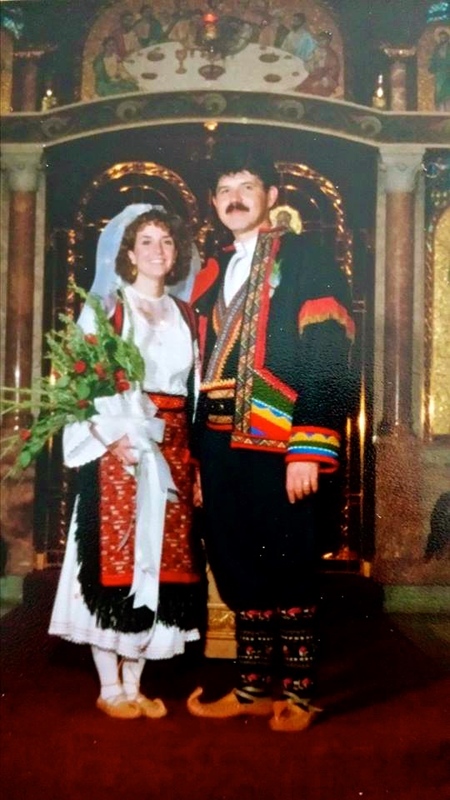 Jovo and Nada Pokonjak celebrated their 22nd Anniversary on October 25, 2014 and posted these wonderful photos on Facebook to share with all of us! 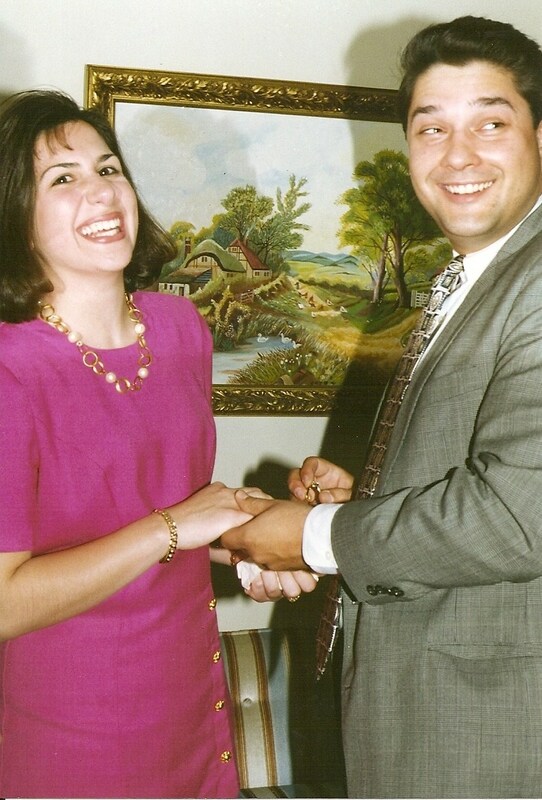 They got engaged on a plane on the way to AUstralia to visit Jovo's Tetka and cousin, and to be Kumovi for a wedding and Christening. Jovo asked Nada to ge the camera out and she was surprised to find her engagement ring in the camera case! Nada says, "It was 1992 and the war in the Krajina was in full swing. We two Serbs from LIKA thought it was the best way to honor our ancestors. We owe thanks to the Sumadija Folk Dance Ensemble for loaning us the narodne nosinje. Mira Babic made the narodne nosinje for us." Jovo added, "The narodnje nosinje we wore were a gift from the Sumadija Folklore Group. I was their director at the time and this was their gift to us. We were truly honored, blessed and overwhelmed by their generosity. Somthing I'm sure we'll never forget. We mixed the Sumadija costumes with our Licke costumes, because it was a way to show that no matter WHERE our ancestors are from, they are Serbian. We weren't just Licani, we were Serbs from the area of Lika (Krajina). We wanted to bring it full circle. 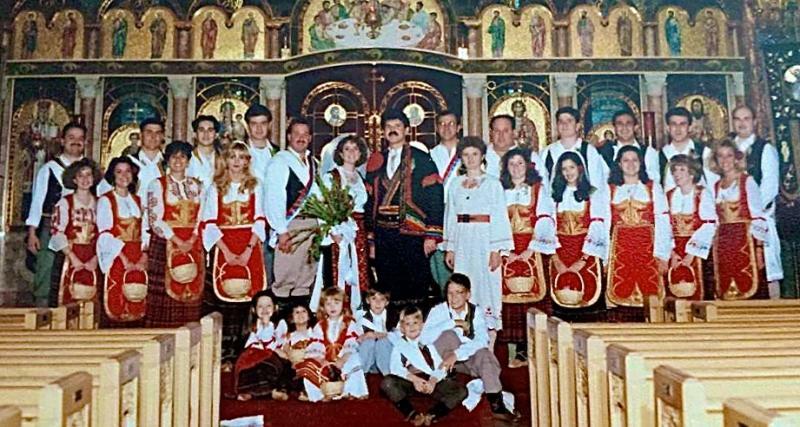 Our childre are the second generation born here in the United States and that does not make them any less Serbian!" 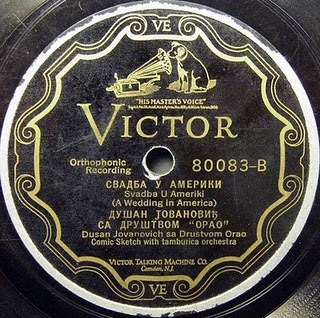 Steve Kozobarich has a wonderful blog, all on old Serbian tamburitza music. Be sure to check it out. SVATOVAC <--------- by "Lira" here. Why not have the legendary "VINKA" sing the wedding song SVATOVAC for you? Again, thanks to Steve Kozobarich! 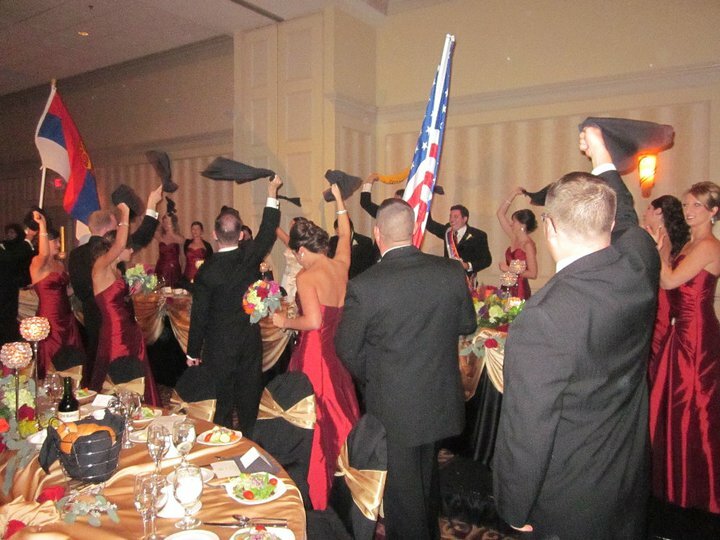 Halle Belosh' and Matt Benusa's "Skup" at the Marriott Hotel in Greentree, PA was exciting too! And finally..... 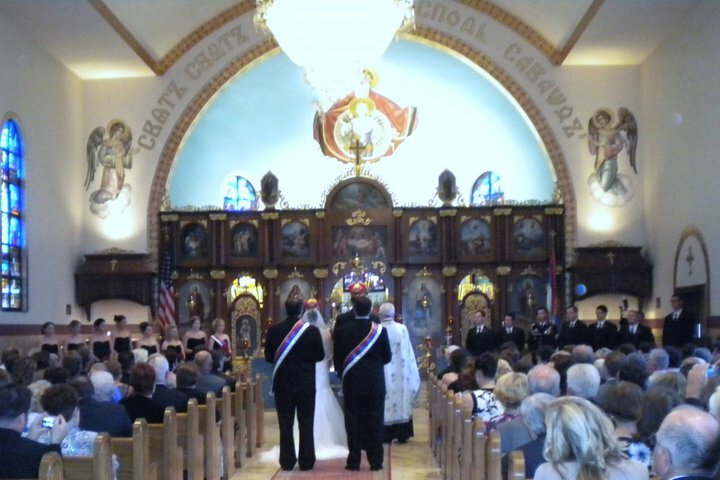 Crowned as husband and wife Holy Trinity Serbian Orthodox Cathedral in Pittsburgh, PA! 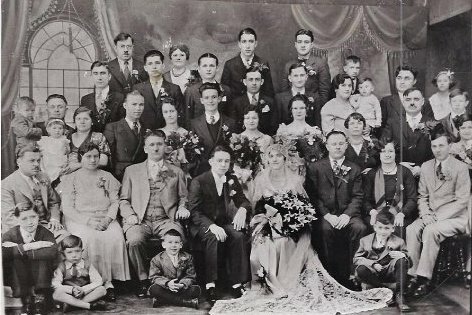 How about an OLD-TIME Serbian Wedding? Here, the Kukich Family from Pittsburgh! 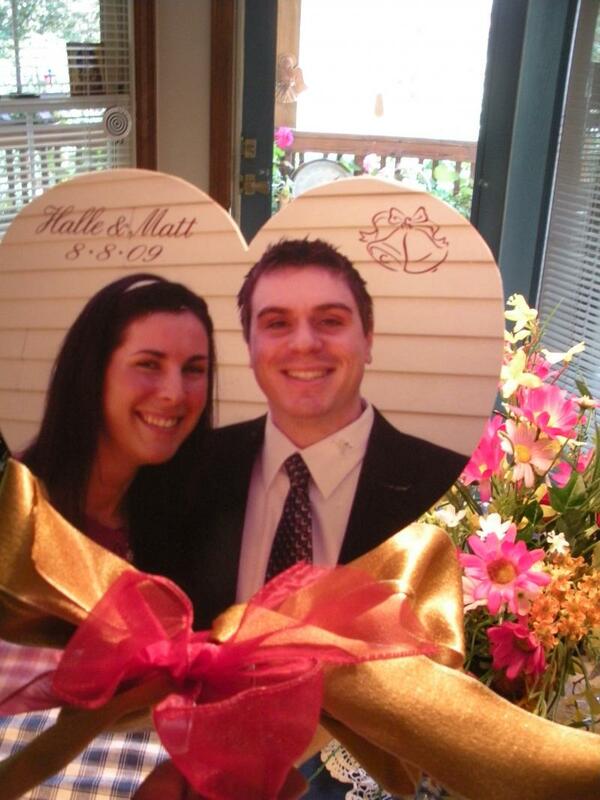 How about this one at Danny & Stephanie Capuzzi's wedding on October 23, 2010? Happy campers in Detroit!!! 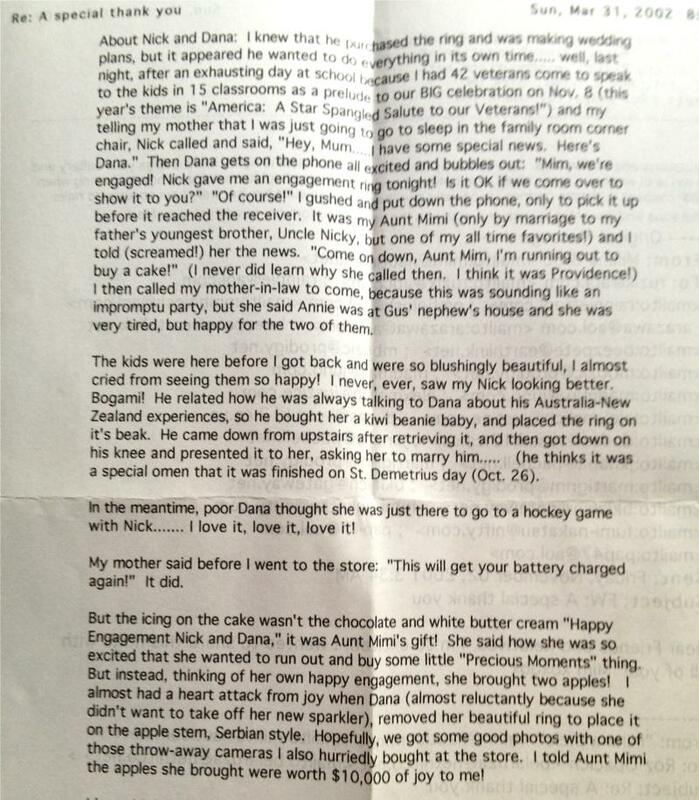 Dane Topich's speaking about the APPLE engagement story reminded me of when Nick and Dana Bizic became engaged. An old advertising card for OXO, featuring the ancient custom of presenting the engagement ring in the apple! Please note that this was from the Dalmatia region, and the Serbian SLAVA icon with the vigil lamp is on the wall. Cousin Marti (Mamula-Trbovich-Cwiklik) Grimes wrote back: "Congratulations to All! Your Mom is right.... it will charge your battery and you will run until empty many times over between now and the wedding. It's such a wonderful feeling when your child chooses a lifetime partner.... especially one that you know suits him/her well." Ziveli! 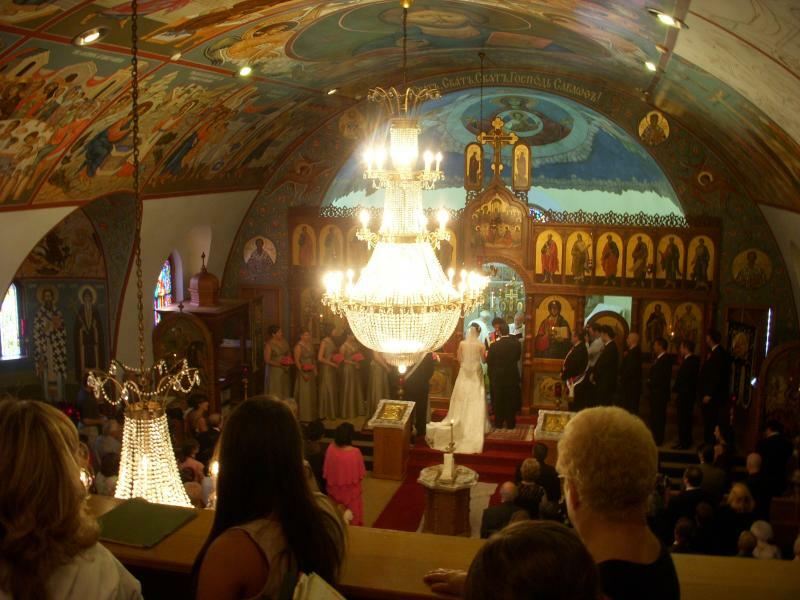 The website above will give you wonderful information about the Orthodox marriage ceremony. The site also shares how the service is divided into two different parts, the Betrothal, and the Crowning. It will tell you about the Rings, and how they are blessed by the Priest in the name of the Father, Son and Holy Spirit; how the weaknesses of one partner will be compensated by the strength of the other and enriched by the union. The Candles play a very important role, symbolizing the perpetual light of Christ, and remind the couple that from now on they must shine in virtue and purity with good deeds. "Just as the candle consumes itself in order to give light and gladness to others, in like manner, the bride and groom should sacrifice themselves in order to help God create life and spread happiness." (V. Rev. Stevan Stepanov.) The candles show the bridal couple's willingness to follow in the footsteps of the Light of Christ, who will bless them in this mystery. Guests seem to love this part, the Crowning! It is the climax of the Wedding service. The crowns are signs of the glory and honor with which God crowns them during the Mystery. The groom and the bride are crowned as the king and queen of their own little kingdom, the home - their domestic church, which they will rule with fear of God, wisdom, justice and integrity. The crowns used in the Orthodox wedding service refer to the crowns of martyrdom since every true marriage involves immeasurable self-sacrifice on both sides. Learn more about how the couple drinks from the Common Cup--- from now on, the Bride and Groom share everything in life, joys as well as sorrows, and that they are to "bear one another's burdens." Their joys will be doubled and their sorrows halved because they will be shared. The wine recalls Christ's first miracle at the wedding in Cana. My heart always stops at this one.... the WALK! Breathlessly, it seems, we watch the couple take their first steps together as man and wife, following the priest, following in the footsteps of Christ around the lesser altar table, which bears a candle, the Cross and Gospel, expressing the commitment to always walk together in faithful obedience to God. The three circles around the table signify Eternity, mapping out the eternal path of marriage. The Russian Orthodox website listed above says that this expresses the fact that the way of Christian living is a perfect orbit around the center of life, who is Jesus Christ our Lord. During this walk around the table a hymn its sung to the Holy Martyrs reminding the newly married couple of the sacrificial love they are to have for each other in marriage - a love that seeks not its own but is willing to sacrifice its all for the one loved. 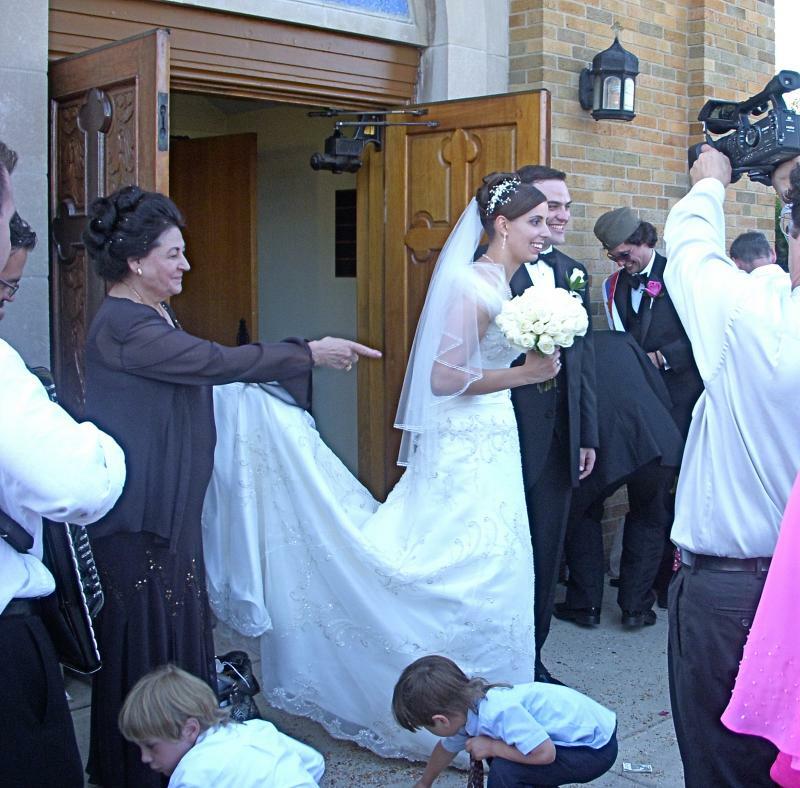 Every wedding attendee seems to extol the solemnity but also the joy of the Blessing, when the Priest exhorts the bride and groom to "Be thou magnified, O bridegroom, as Abraham, and blessed as Isaac, and increased as Jacob, walking in peace and working in righteousness the commandments of God." And blessing the bride he says, "And thou, O bride, be thou magnified as Sarah, and glad as Rebecca, and do thou increase like unto Rachael, rejoicing in thine own husband, fulfilling the conditions of the law; for so it is well pleasing unto God." Before leading the couple on their first walk together as husband and wife, following in the footsteps of Christ, the priest ties the right hands of the couple together while praying for their marriage, the act signifying their "Oneness" from now on. 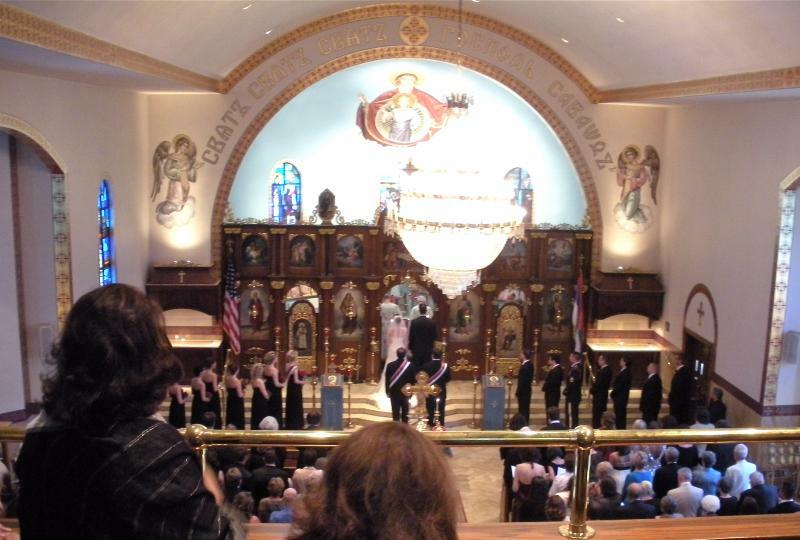 Eastern Orthodox wedding ceremonies are FULL of the most magnificent and profound symbolism and meaning. You KNOW you're married after this beautiful ceremony uniting two as one. 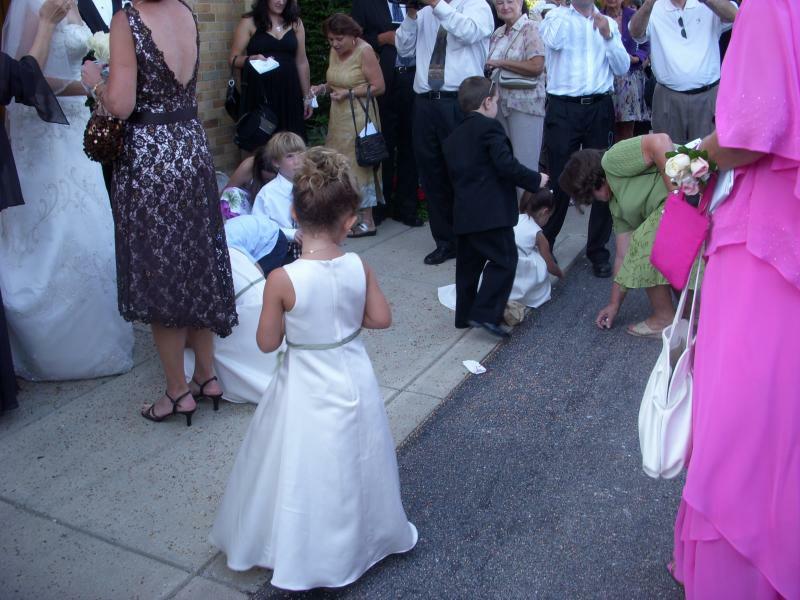 One of my favorite wedding memories was the wedding of my cousins' daughter Jennifer to Sasha Trklja from Toronto, about 5 years ago. The "Skup" was a phenomenal event, with the whole Canadian contingent walking en masse down to the Bride's home, with a Kumstvo boasting 300 years of continued friendships. After all the toasts, the wedding party and guests drove off for Pittsburgh's Holy Trinity Cathedral. The American and Serbian flags were flying out the window in the car following the white limousine, and every driver behind seemed to be "beep-beep beeping" their horns for joy as the caravan wound their way through traffic, just adding to everyone's excitement about the whole affair. Even the bride got caught up in the vibrant atmosphere. "Jennifer!" her mother pleaded this time, trying to maintain some semblance of decorum. "Get your head inside. You're the BRIDE, for Heaven's Sake!" "I know!" said Jennifer smiling and flashing her 3-fingered salute to all with even more action, then she breathlessly said, "and I'm LOVIN' it!" & Fr. Rajko Kosic have their hands tied, symbolizing their ONENESS, and the crowns signify they are King and Queen of their own household from now on. There is NOTHING like a Serbian wedding! Please click the lower right hand side of the photo above to enlarge and see the beautiful setting for this wedding. Dane asked Maca to marry him on her St. George Slava! "I really don't remember ever meeting her. We just went to church together. Eventually, things just came together. I was helping with Shadeland and she was a counselor. Our Kuma Vera Prpa lived in Hamilton. We went to the Srpski Dan picnic in Niagara Falls. I remember driving home from the Cleveland Basketball tournament with Maca. We were friends through all of this but soon enough that changed. Here's some family trivia for you. Our first official date was the day Peep (Millicent Mamula Bobik) died. I cut the date short to go over to see Jules. As for the engagement, it was Djurdjevdan and that is the Radovick Slava. I think timing just worked out to have it that day. I went to Bobby's house first and all my guys met me there. 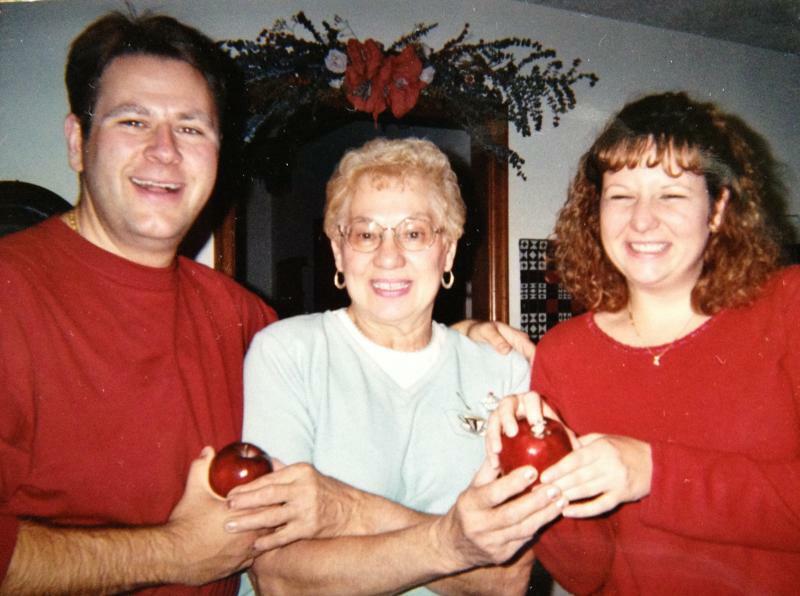 We then drove out to the Radovick's where I had the apple and ring (and about 100 people waiting for us). Proto Stepanov had an engagement ceremony. It was right after Easter so everyone sang "Hristos Voskrese" to start the service. it was a goose bump moment that Maca and I still talk about. We spent the rest of the evening celebrating. My friends played for our orchestra, and the rest is history as they say!" Great story, great families that got together! Yes! 22 years as of 2017! The Sacrament of Marriage is conducted in the center of the Church AFTER the Betrothal at the Altar. V. Rev. Fr. 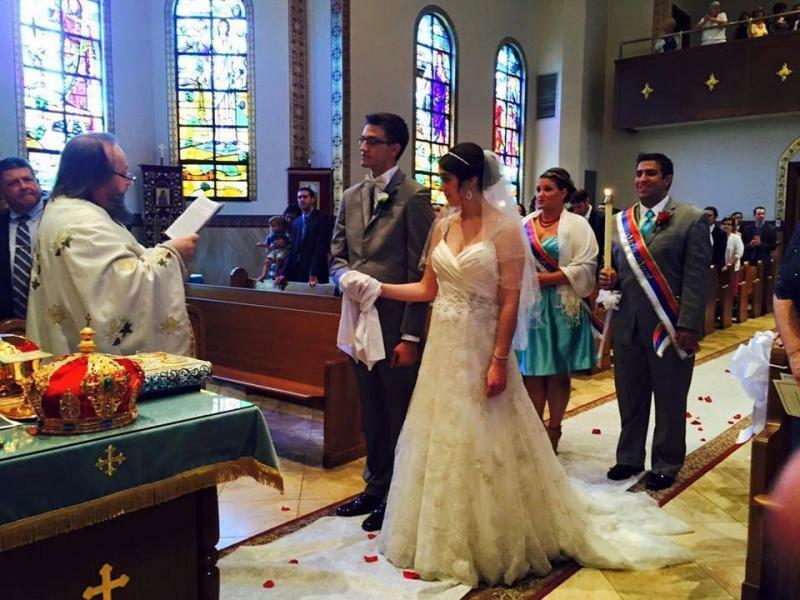 Milan Krstic read three long prayers invoking the blessings upon the couple and recalled examples of biblical marriages that were blessed by God and served as instruments of God's plan of salvation for the world. The third prayers asks God to unite the couple, and as an outward sign, the right hands of the pair are tied together with a white cloth! The crowns are sitting on the Altar Table, ready for use to have the ultimate expression of spiritual reality of tthe Sacrament. The bride and the groom are "honored" and "glorified" as husband and wife, as king and queen of their own dominion---the family. The crowns also reflect the reward awaiting them in the Kingdom of Heaven.